After the start of The Welkin Suite IDE, you can see a start screen with no opened projects. Here you can find the links to The Welkin Suite's website, Documentation, and Support. This window represents you the latest opened projects if you have such ones and the options to create or open a project. Near to the list you can see the latest news of The Welkin Suite. In order to start developing, you need to download your project from Salesforce org. To start the New Project Wizard, click on the New… link. If you heve an opened project already, you can create a new one from the Main Menu of the application: File ⇒ New ⇒ Solution…, or press the Shift+Cmd+N hotkey. The New Project Wizard determines which type of a project you are going to create, and it gathers basic information, such as the project name and the location, in which all the project files will be stored. Salesforce Project — a universal project that covers all of the basic needs for Salesforce Development. Click the Next button to configure the project on the next step. By default, all projects are stored in the users Projects folder, but you can change the location for each project by entering a path manually, or navigating to the required folder by pressing the Browse… button. Please note that a specified location determines the parent folder for a project. 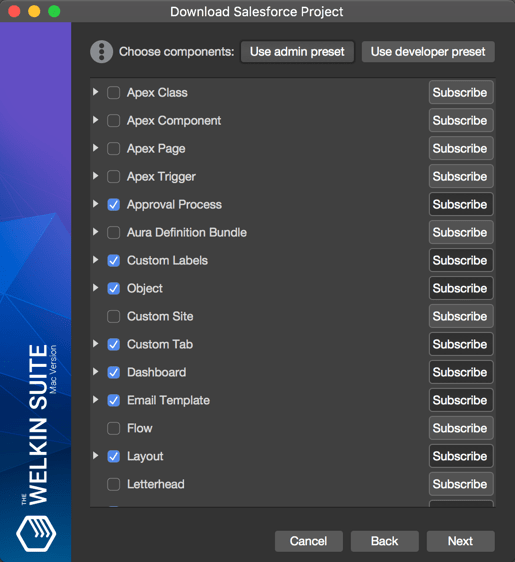 The Welkin Suite automatically creates a folder with the same name as the project. After entering this information, you need to click the Create button and specify the Salesforce specific information in the Download Project window. In the Download Salesforce Project window, you need to select the environment type (Production / Development or Sandbox) and enter the Salesforce credentials. Salesforce environment, Username, and Password are required fields, while the Security Token is optional — only if you have configured an org to allow logging in without the Security Token, you can omit the Security Token. If you forget to enter the security token, you will get the error message. Once you have filled in all the required information and pressed the Next button, the metadata downloading process begins. Next, you get a window with the list of metadata files that will be pulled from Salesforce. Please select the files you want to download within your project. At this step, the IDE sends multiple requests to Salesforce to get the available list of supported metadata items for your TWS project. Each request is related to the specific metadata type, and as a result, each response from the server is handled separately. This way, the metadata appears in the list right after the IDE receives the information about it. The progress of the download process for your metadata files is displayed for your to track, thus allowing you to cancel loading of the files for some metadata type if necessary. The preselected list of metadata types depends on the IDE layout that you use. You can also change the selection of the metadata types or click the button at the top of the window to change the preset: Use admin preset / Use developer preset. Each of the items on the list of metadata components can be expanded. If you choose to expand, you will see a list of separate files that will be downloaded in terms of a certain metadata type. By default, all of them are checked, but you can deselect those files you don't want to be downloaded at the moment. This window also features the Subscribe button across each type of metadata components. By clicking this button, you subscribe to any file updates for this metadata type. This means that next time you pull files from your Salesforce org, the new files in the metadata you subscribed for will be downloaded automatically. In addition, this option implies to any metadata that isn't created on your Org yet: you'll automatically get its files after the pull process. After you are done selecting the necessary components, click the Next button. 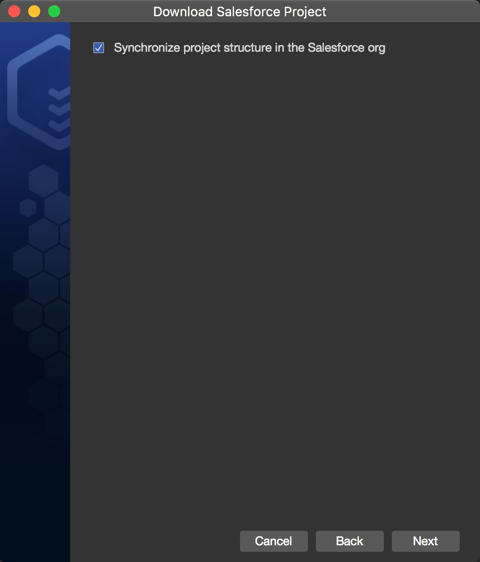 At the next step, The Welkin Suite asks you whether you want to synchronize your project structure with the Salesforce org. NB: The ability to sync project structure is available for Sandboxes and Developer orgs only. If you are downloading a Production project, you'll still get this window, but the checkbox won't be selectable. After you are done selecting the necessary components, click the Next button and the download process is started. At this step, the IDE sends multiple requests to Salesforce to get the available list of supported metadata items for your TWS project. Upon its completion, you will receive the successful message. When the project is downloaded, you can start working with it immediately by pressing the Finish button. it restores opened files in the editor. During the loading process, The Welkin Suite will consume more CPU and RAM resources to do this as quickly as possible. Depending on the size of the project, it may require different time from one second for relatively small projects and up to a minute or two for huge projects with thousands of files in them.